This entry was posted on June 15, 2010 at 8:09 am and is filed under Climate change. You can follow any responses to this entry through the RSS 2.0 feed. You can leave a response, or trackback from your own site. I think you need to read the book! £7.34. About the same as a couple of pints. Go for it. I’ve mailed you a copy of the book. consider this a contribution to you and your department. Well, that’s very generous of you! I’ll get a review of it on here as soon as possible. Yes, very kind of you! I’ve read the first few chapters and am preparing a post on the bits that overlap with what I wrote on the subject. I’m a few chapters in now and making lots of notes! It seems nicely researched in places but I think that large parts of Montford’s central thesis are unsubstantiated. I’ll write a post as soon as I get some free time. Did you see the RealClimate review of the book? Not very positive! I think the “case for the prosecution” is detailed in many other places, not just the book. Well as the HSI is now widely regarded as the ‘standard work’ on this particular topic, a thorough understanding of all of its contents would seem to be a prerequisite for a serious rebuttal of the charges made. Otherwise your contribution seems like Hamlet without the Prince. I suggest that you add it to your reading list asap. Do you think HSI is more important than Wegman? And your link to ‘what the scientists wanted all along’, does not point to a page that suggests or proves this at all. More interested in discussing Steve Mcintyre’s work than the ‘scientists’ motivations. Poor show. In my view, this highlights the motivation of the IPCC and shows the kind of quote mining and selective quoting that’s been going. I suggest you read the whole email thread. Then you have the full context and you can see that most of what is discussed is the decline. Also, take a look at the spaghetti graph. If it is the low frequency variance that is diluting the message, why can’t we see this in Briffa’s results, which have very similar low frequency variance to the multiproxy lines? The message on variance is not diluted at all. The question at issue is not whether McIntyre selectively quotes from something. Whether he did or not has nothing to do with your assertion that ‘the scientists wanted the truth all along’. You have produced an e-mail where the words’ we want the truth’ are used. Fair enough. But once more, Montford’s book shows in step-by-step detail exactly what lengths the scientists would go to to prevent anybody else from finding out the truth. It is a sad and squalid tale of obstruction, obfuscation and underhand dealing. That you haven’t yet chosen to familiarise yourself with this story once more weakens your case. That you choose to believe a single assertion from one e-mail to demonstrate the motivations, rather than their committed actions suggest to me that you have a very high credulity tolerance in these matters. the hockey stick debate, though not necessarily of huge importance to the issue of AGW, has made me very sceptical largely because of the failure of scientists to accept the very clear deficiencies in the Mann et al work, although this has been pointed out with great clarity, see for example the Wegman report. Contrary to what you say the statistical techniques used do make a difference – the hockey stick seems to be largely either an artefact of the statistical techniques used (MBH 1998) (Mann et al 2008) and/or a simple consequence of using carefully selected datasets and ignoring other equally good or even better datasets. The essential hockey stick trick is to give any hockey stick shaped series very much higher weights than non-hockey stick shaped series. I am not sure what you mean about Mann’s PNAS reply showing that the criticisms were strange. The criticisms were twofold. the first was essentially that if the series were temperature proxies they should all tell a broadly similar story – they should be coherent and this could be tested for. To this Mann did not respond. The second was to point out that Mann had used a proxy upside down. PNAS comments have a strict word limit not allowing a fuller description. The issue was that lade sediments became thicker in the recent past because of human activity round the lake. Mann interpreted this evidence as thicker sediments imply higher temperatures. but the original author had clearly stated that in earlier times it was thinner sediments that corresponded with higher temperatures. Mann’s response about multiple regression being invariant to the sign of the variable is correct i itself, but completely irrelevant to the issue (which is that the proxy in effect changes sign over the period). You make some interesting points and I wasn’t trying to say that the “Hockey Stick” is perfect. There are some issues relating to the statistical methods that need examining by people that understand them better than I do! Equally, it seems that the Wegman Report has some big questions to answer as well (namely, poor scholarship and data manipulation). Wegman is a very distinguished scholar – just google his cv. These attacks on him are just attempts at diversion from the substantive issues. The statistical issues involved are not very complicated and one of the things that has shocked me is how poor the statistical treatments are in some high-profile climate science – Gavin Schmid’s supposed refutation of Michaels and Mcktrick’s work on UHI contains two glaring statistical howlers. I fail to see how you can do decent non-experimental science without a decent grasp of modern statistics. I’m not sure I can agree that’s its just a diversion – the treatment of the IPCC FAR Fig. 7.1c was pretty shoddy. I’m not saying that the Wegman Report doesn’t raise valid issues – it clearly does – but it also seems that there’s some poor work in there as well. It is just a diversion. The discussion of this graph has absolutely no bearing on the criticism of Mann’s methods about which Wegman was both unequivocal and right: MacIntyre and Mckitrick’s criticisms of MBH procedures were entirely correct. Have you read the Wegman Report itself? Or just the criticisms of it? I’d recommend you read the actual report to get some context before you get too deep into allegations made about it by partisans on “the other side”. I’ve read the bits of Wegman that seemed important/relevant to the blogposts I’ve written – its not particularly relevant to the day job. Maybe I should give it proper read through – all the commenters here seem to hold it in very high regard! MS. SCHAKOWSKY. Exactly. So would you agree then that climate scientists are those that we should primarily refer to when we are asking questions about climate? MS. SCHAKOWSKY. […] do you believe that your report disproves that climate change is manmade in any way? DR. WEGMAN. […] The other side of the coin is that, you have tried to get me to say that manmade carbon dioxide emissions are associated with the global warming. MS. SCHAKOWSKY. Which you can’t, right, because you are not a climate scientist. AR, it would have been better science and reportage to actually go and read McIntyre’s stuff rather than rely on hearsay information. Steve breaks down things into smaller chunks to focus on. By the time he finishes all is dealt with. The entire email is always available at links and all the regulars are well aware/have read huge swathes of the emails. He has always published his data and codes. He’s the gold standard for accuracy and transparency. In the end, the evidence, the data, the Science should speak and it really matters not one whit from whom it comes and why. When scientists hide their data, refuse to debate and stonewall – then the reason why becomes important. What are they hiding? You accuse McIntyre of quote mining and selective quoting – yet you accept DC’s version of the truth without question. Do read the Bishop’s book – you can’t really investigate the HS without doing so. And you are in for a treat. Clear thinking, good writing. I think you should read the book. After you read the book you get the context. And the resistance to hand over the exact procedure and statistical results, the invention of new statistical measures all points to …what? The IPCC received the stick with open arms because they wanted to present a nice and tidy story. They wanted to exaggerate. And if you exaggerate just a little bit on many points you end up with a totally flawed big picture. We the public does not want a nice and tidy story, we want the truth. I’m intrigued by your statement that “the response by Mann et al. showed some of those criticism to be quite strange”. Mann certainly asserted that some of the criticisms were odd, but I can’t see where he “shows” anything at all in that article. I was referring to the “bizarre” paragraph. Thanks. Here Mann asserts that ‘the claim that “upside down” data were used is bizarre’. Are you suggesting that Tiljander’s data was used the right way or up, or just that it has no a priori orientation? Mann used the word “bizarre”, but I can’t see how he *showed* anything by it. However the claims might seem to Mann, they were nonetheless *true*, and nothing in his response showed otherwise. In short, Mann’s claim to have adequately addressed the “upside-down proxies” question is, itself, “bizarre”. Part scientific history and part detective story, The Hockey Stick Illusion tells the extraordinary tale of the iconic global warming graph (created by the US climatologist Michael Mann), the global panic about climate change that it has helped to feed, and the tireless efforts of a lone amateur researcher, Steve McIntyre, that have comprehensively discredited it. From the earliest attempts to reproduce the Hockey Stick graph, to the explosive publication of McIntyre’s work and the launch of a congressional inquiry, The Hockey Stick Illusion is a remarkable tale of scientific misconduct and amateur sleuthing. It explains the complex science of this most controversial of scientific findings in layperson’s language and lays bare the remarkable extent to which climatologists have been willing to break their own rules in order to defend climate science’s most famous finding. Already acclaimed by experts in the field, The Hockey Stick Illusion is an indispensable guide for anyone wanting to assess the credibility of global warming science. I’m not sure that the Christopher Booker association is necessarily a good thing! How difficult is reading if the likes of Booker can do it. So are you going to read the book? Like I said in the post, I’d like to read it. The Wegman Report seems to be getting equally high praise here though (and that’s free!) so I’m might give that a proper read through first. Matt Ridley, Britain’s version of Lomborg and one of the main actors in the collapse of Northern Rock. I’d take that review with a pinch of salt if I were you. You assert that “Mann et al. showed some of those criticism to be quite strange”. This is untrue. Mann et al “showed” nothing of the sort. All of our criticisms were are are well substantiated. Mann asserting something does not make it so. Oddly enough I’m revising a paper today so dealing with reviewer comments feels quite familar! Thanks you for your comment, I have replaced “showed” with “suggested”. I’m afraid your original text was depressingly typical of the approach of many climate scientists, who simply believe Mann’s assertions that he has refuted skeptics’ claims, and then attack those same skeptics for making “bizarre” claims. It really is terribly unwise to simply accept Mann’s ex cathedra pronouncements without basic scrutiny. Is that not true? I assume that this is all they wrote on this subject as the word limit for responses is very low but, unless they’re wrong, this short statement seems to deal with the comment. The sort of multivariate regression techniques that Mann used are effectively data mining: you take a bunch of datasets that you have some vague reason for believing might be proxies for temperature, and then regress them against an instrumental record for some calibration period. This reveals the small number of “proxies” which did in fact correlate well over that period, and you then attempt to reconstruct other periods by assuming that the same datasets are similarly good proxies over other periods, effectively weighting them by their correlation coefficients. Like any data mining approach this is fraught with dangers; in essence you can just pick out a bunch of random noise sequences which happen to correlate by chance. This can be partly guarded against by checking the reconstruction against a verification period, though you have to be extremely careful how you do this, and many criticisms of Mann’s verification statistics have been made. There is, however, a simpler check, which is just to look at the sign of the correlation. If a “proxy” anti-correlates with the instrumental temperature, going down when temperature goes up, then the regression program will give a negative correlation coefficient, and so it contributes to the reconstruction with a negative weight. Nothing wrong with that. However for most plausible proxies it is possible to assign the sign of the correlation coefficient a priori (indeed some people would argue that if you don’t even know the sign a priori, then the chance of something being a genuine proxy rather than just fortuitous noise is low). Now we turn to Tiljander’s sediment data. This data does have a well defined a priori sign, but it turns out that when placed into Mann’s program it comes out with the wrong sign for the correlation coefficient, so that in the reconstructions it is turned upside down. Why did this happen? Because Mann’s correlation is run against the modern period, where Tiljander’s data is badly contaminated by the effects of bridge building, and this modern contamination correlates well with temperature IF you turn the dataset upside down! So yes, multivariate regression methods are insensitive to the sign of the predictors, but no this doesn’t mean that it can’t end up using datasets “upside down”; in the case of Tiljander’s data it can and it did. Why anyone should produce a work of fiction to support another work of fiction escapes me. I suppose that is what passes for science these days. I’m please to see anyone trying to get to the bottom of the Hockey Stick story, it’s one of the real bugbears in climate science. The Hockey Stick issue is like a case of adultery. Once it’s happened, the injured party starts questioning everything. Trying to lie or cover it up or dismiss it as unimportant, only makes it worse. Are McIntyre and his peers right in their assessments of the Hockey Sticks? I don’t know, but they make a powerful case. The only people who can iron out the points they raise are climate scientists themselves and they steadfastly ignore Climate Audit. The various reports and investigations into the work of Mann and Jones and the CRU conspicuously ignored the key people on the sceptic side and pitched amateurs (eg Lord Lawson) against multiple professionals (Phil Jones, Julia Slingo, Bob Watson, etc). They didn’t even make an effort to try and build balanced (sceptic and supporter) investigation teams which makes you wonder if they even understand the concept of bias. This odd behaviour is ongoing with the Inter Academy Council’s IPCC Review. So if one uses the Hockey Stick as a measure of climate science’s wisdom and commitment to accuracy and honesty you have to doubt the whole CAGW edifice. It is in everyone’s interest for the Hockey Sticks to be properly investigated. there is a general problem here. If you write about something (the hockey stick) and you don’t really understand the issues, you have a problem. You have to take other people’s word for something; and whether someone appears trustworthy, or whether they have published in Nature/ PNAS/ etc ., is no substitute for making your own evaluation of the science. There are significant “statistical” issues; strangely enough, the NRC and Wegman reports agree with each other on the statistical issues. However, just as important is whether the proxies have been selected to give the desired signal. The proxies are highly selected; the basis for selection isn’t at all clear. Some of the most influential proxies in the MBH ’98 paper were strip-bark pines, and the NRC report said these should be avoided. You can go look at the reasons if you wish. And in case you hadn’t noticed, many of the issues that were identified in MBH’98 plague the following reconstructions. There are after all only a very limited number of proxies that can be used to produce a hockeystick; and shaking the same proxies up in different combinations, and using different algorithms to process them, simply produces the same result. It isn’t a surprise. So your rhetorical flourish that sceptics have put all their eggs into one basket is very pretty. But if I demolish the foundation of a building, then surely all the floors built upon the foundations are demolished too ? Although there are a wide variety of responses to McIntyre’s work, I note two types of response that are particularly popular amongst the pro-consensus group. The first type of response is those who complain that McIntyre is obsessed with the Hockey Stick and that he should just move on. The second type are of the kind presented here by Andy – and is exactly the reason why it is impossible to “move on”. Because a large number of the pro-consensus group won’t let it die the undignified death it so richly deserves. A small point of note: the only thing difficult about the stats in the Hockey Stick paper is disambiguation of the woefully inaccurate description of the methodology in the original texts. Once this has been figured out, and many people have already done this on your behalf, the stats should be well within the average hard science PhD’s capability. The stats are just a botched version of an otherwise very well known multivariate technique (developed over 100 years ago) using data from the 1980s. The comment by William on the Wegman report interested me. I hadn’t seen that and the way William presents it, it looks pretty bad. Not quite as bad as Phil Jones’ WMO status report botch, but not good either. Then I read the paper and realised that Wegman is not claiming it as some kind of alternative temperature reconstruction, but as a pseudo-proxy to illustrate the behaviour of the statistical methods. Just to give you an idea, Hans von Storch used Echo-G output and German unemployment records (!) as pseudo-proxies. He didn’t claim these were temperature records, either. Steve McIntyre used daily tech stock values up to the tech boom. These guys don’t claim these values are any kind of temperature measurement, either. I’d agree Wegman was sloppy in his digitisation – particularly being 100 years out, and apparently forgetting to tidy up the axis labels. If Wegman was claiming this was a scientific measurement with some merit – like Phil Jones did on the front of the WMO status report – that would be very bad indeed. But Wegman was using it as a cartoon to demonstrate the properties of a statistical method. As noted in the comments at Stoat, Wegman underlined this point in his testimony. Still sloppy, but not quite the story that you and William want to paint it as. Are your “two types of response” a bit too black and white? The original motivation for this post was to show that its a classic example of how science develops, which is more of a grey area. There shouldn’t be one camp saying “this is perfect” and another saying “this is completely flawed lets throw it away”. The criticism helps the science develop; its just more out in the open, with more non-experts (me included) commenting on it and more heated in this case. I’d also that the von Storch paper has come in for some criticism too. The Wegman treatment of IPCC FAR Fig. 7c isn’t the only criticism out there but its nice to see that there are lots of people out there defending his work! Makes a change to see someone held up in such high regard. What has kept me interested in this area is precisely how differently controversies in this area develop compared to that in my own field of economics. We have bitter controversies but all sides appear in journals all the time, and blogs. The controversies over Keynes work in the 30s lead to a huge explosion of journal articles. as did the Keynesian-monetarist controversies of the 60s,70s and later. It was easy to read argument and counter argument. Moreover with the development of computers and electronic storage it has become the norm in the better journals for data and programs to be deposited with journals at the time of submission precisely to avoid controversies over exactly what people did or did not do. Economics and econometric articles also appear to have much fuller descriptions of exactly what was doe (no one could accuse Mann of making full descriptions – to this day no one but he knows how he calculated his “confidence” intervals in MBH 1998). The McIntyre McKitrick criticisms, largely of a statistical nature and therefore within my area of expertise, seemed to me precise, accurate and devastating. I have never seen any satisfactory response, only a lot of evasions, misdescriptions, attempts to keep criticisms out of “good” journals and special pleading. There is always plenty of noise in these sorts of controversies, but on this one the debate seemed to be all noise. Wegman told it like it was, but his substantive poitns were completely ignored. This is not how any controversy I am familiar with in my own field would develop. MBH would have passed into well-deserved oblivion long ago and people would not still be using his work in later re-constructions. I am fascinated and appalled, and it’s made me wonder whether the rest of climate science is like this… It certainly seems that statistics is not their strong point. So, to cut a long post short, what is peculiar about the hockey stick story is precisely that valid criticisms have NOT helped science develop. They have just been denied. Michael Mann has done more to make me sceptical than any other writer! And on the Wegman figure, as has been explained already, note the context. What Wegman is saying is that the MBH version of PCA is actually a wonderful shape-matching algorithm. Choose the shape you want to get out, and it will do it for you. He demonstrated this with the IPCC FAR cartoon, and that is its point. So once again critics are avoiding the substantive point and concentrating on misdirection. Andy, I have to admit I’m perplexed by your response. You say my view is too black and white but I made it clear that I was addressing two types of comment from a much wider range of criticisms – which is an entirely valid thing to do and not a black and white view. Further, you characterise the criticisms as “science” – when they are nothing of the sort. Opining on whether McIntyre is obsessed with the hockey stick is not a scientific criticism. You then go on to create another straw man – about people expecting perfection. Seriously. No sceptic is demanding perfection. But using valid statistical methods isn’t about “perfection”. It is just about not getting things wrong. The Wegman report, on the other hand, is a contribution to the science. I didn’t just believe McIntyre and Wegman because they reinforced beliefs. I compared the claims of these, as well as the claims by Mann, Wahl, Amman, as well as important contributions by von Storch, Burger, Cubasch (all of whom have made important contributions). Even to the point of implementing some of the methods to check their properties. And without question, I have found the claims made by Wegman, McIntyre and von Storch are more compelling than those made by Mann et al. Of course, explaining this requires an incredible amount of detail and would fill hundreds of blog posts. I recommend you read the book. It would save us all a lot of time. Andy, this comment is really a response to your inline response @10:32am, as the threading seems to reach its limit there. We’re clearly talking past each other at the moment. My comment provided an example case of one of the criticisms levelled at McIntyre. I used this as an example. You responded to this; so I merely continued my example. If your reply to me was not about this, then I think you’ve probably missed the point I was making (which was merely an observation on the wider conduct of this debate, rather than on the scientific aspects; this seems reasonable, given this is a “history of” type post rather than the scientific detail). On the perfection issue, you say you thought you were characterising my point by raising it. I also note you attempted to characterise someone elses point above by referring to perfection. At no point in my original post did I suggest, demand, request or require any kind of perfection. This is why I said that you raising it is a straw man. A straw man argument is one that you impose (or characterise, if you prefer) on me that I did not make. By suggesting this is a straw man, I am specifically telling you that you have misrepresented my views. I’m not sure how I can make this any clearer. What I’ve said is pretty straight forward. And guess what, Mann — in one of the emails — said that McIntyre “almost had a point on the PCA stuff, if it had made any difference to the results.” (this is a paraphrase). That might explain why he doesn’t use his original method on analysis anymore. Steve really hasn’t come up with any cogent critiques of his subsequent methods of analysis. The point is that there was an error in the original analysis, and new methods have been developed which give better results which do a better job of retaining long term variability. This is how science progresses. In fact, by the time that Steve published his critique in GRL Mann was already using a different analysis method. That is how science progresses. The error in the PCA was just one of the serious problems. The lack of robustness of the result to just one or two indicators and the failure of signficance of multiple cross validation tests were far more important failures. As for Mann’s later work, if you strongly believe that Finnish civil engineering projects teleconnect to Northern Hemisphere temperatures, then fine. It doesn’t seem terribly plausible to me, though. As for later methods such as RegEm, McIntyre was beaten by Jason Smerdon (et al) in pointing out the flaws in this. Not much point in reinventing the wheel. “Stoat” – William Connoly (sp?) is a dedicated AGW proponent, he’s the, errr, guardian of the hockey stick on Wiki and has had his editorial privilages suspended there once. He rapidly edits anything that is contrary to the religion of AGW. I’d suggest that Climate Audit comprehensively demolishes the Hockey Stick on several occaisions. It is a product of data dredging & post-hoc analysis. Tell any author of a medical clinical trial how the data is manipulated and they’d treat you as a fraud. Start with a theory that “Treemometers” are temperature proxies and nothing else affects them. Decide that modern temperatures are the highest since (insert date as necessary), look through your trees and find any that support this hypothesis & discard any that don’t. For added value, chop off your “Treemometer” record at c 1960 as things start going wrong there, justify this with an unsubstantiated hypothesis that “something” is making the trees no longer act as thermometers, so graft the historic temperature record (That’s been subjected to muiltiple, un documented “adjustments”) onto the plot. Now apply a 30-year smoothing, which will in effect chop another 15 years off the treemometer record. If anyone says this has been done, claim that it’s a bizarre claim and no scientist has ever done that. Throw in a few lake bottom sediment records, but make sure they’re used “inverted”, deny this makes a difference, despite the person who collected this data initially saying that it does. Ignore any human activities like logging & road/bridge -building that may impact on the sedimentation. Obviously, when any paper is produced to cast doubt upon your version of the data, ensure that all your cronies are on-message before it’s even been published. Now throw in a political body (The IPCC, in case you’re unaware) that wants the present day to be hotter than hell & it’s all our fault (Well, the USA’s & Western Europe’s) so that a suitable tax pennence can be applied and there’s your hockey stick. It’s a product of poor science and vested interests. So you have not read the Wegman report either. It would seem that lay people are better versed on this matter than yourself. So your approach is more political than scientific. It would appear that you have only ‘tricked’ yourself. My post wasn’t about the Wegman Report! It was about the changes in the palaeoclimatic analyses that have appeared in the IPCC reports since 1990. Wegman is peripheral part of that story so I read the relevant bits and some criticisms of it. Do you think Wegman is more important than that? As for your other point, I’m not sure why you’d think my post is political. I’m just looking at an interesting and important area of climate science. I never claimed to be an expert on dendroclimatology but it interests me and is broadly related to what I do. See how you get on! Very interesting and informative – thank you. I’m baffled, though, by the obsessive nature of some of the people you have had posting on here. They seem to find the truth in one or two reports, and one or two bloggers, and are skeptical about everything else – especially anything that suggests global warming is actually occurring. It seems to me that some people actually believe that if they can prove the so-called ‘hockey-stick’ to be broken (even though it is over 10 years old, the rest of the scientific community [and the science, more importantly] has moved on and forwards, and there are a multitude of other studies that give the same outcome), then that will prove the death-knell of global warming. I suppose we’re all a bit guilty of being less skeptical of things that confirm our own prejudices. But you’re right, this phenomenon seems particularly common in the climate change arena. Not unquestioned support. We have read it, saw the demonstrations and have not seen any rebuttal of the conclusions about Mann’s methods, also agreed, though with some equivocation by the NAS panel. And then? Deafening silence on the main issues. If you want to make me question the Wegman report’s conclusions about Mann’s methods show me where he was wrong. I shudder at the thought of the kind of closed-off thinking that would lead someone interested in climate science to describe The Hockey Stick Illusion as “the standard work” on any subject related to Paleoclimatology. Such wild claims should be properly sourced, if they are to be made at all. It should be obvious to us all that the book is no more a standard work on any subject than the infamous Fox documentary is a standard work on the Apollo project. It is correct, I think, to say that some critics such as Steve McIntyre find it difficult to move on, and a whole host of associated denialists take their lead from him in seeing the whole of climate science through the prism of some statistical criticisms of MBH 98. Summary posts like the above do a lot to set the record straight, and if the best criticism that can be made is that some people don’t think you say enough attention to McIntyre, Wegman or even Montfort then that speaks for itself. The science has moved on since 2001. Attempts to resurrect what in scientific terms is a long-dead controversy have failed, even when the magic mantra “Climategate” is fervently chanted. The skeptics have to produce some good science challenging global warming, and soon, or they risk drifting ever further into an irrelevant fantasy world, joining the committed denialists in picking over long superseded papers and demanding a reassessment. If climate reconstructors would stop using methods of proven inadequacy when the inadequacies were pointed out then we could move on. But ubntil then not moving on is just good science. “The skeptics have to produce some good science challenging global warming,” They could always publish a reconstruction of recent climate. But then that would be subject to scrutiny and testable conclusions. That would be advancing science. Not on the cards for the likes of McKintyre or ‘BishopsHill’. Not all skeptics are so anti science though, Christy and Spencer to their credit have been criticising AGW while doing real science that has helped advance our understanding. Unfortunately it confirmed the warming trend. Proving that a method is wrong moves science on whether or not there is an existing alternative. Refusing to accept evidence that a method is inadequate when it clearly is does not move science on at all. The anti science crew had there moment. They pointed out that a famous papers statistics were not up to scratch. That was about what? 10 years ago. They continue to trade on past glories like the English football team and 1966. The time for them to make a more substantial contribution has passed as others have taken those critiques on board and published new science. Is an excellent case in point. Producing more open and testable science without turning itself into a monotone inquisition playing up to a highly charged partisan crowd with dog whistle insinuations of criminal activity. There time is up, pointing to what you think are incorrect methods is good for a couple of blog posts and few newspaper articles. The Watts, Eschenbachs, McKintyres and company have failed to produce anything other than moans on the internet. No reproductions of long term temperature trends, no reworkings of the GISSTemp, no GCM models that show low climate sensitivity. In short no science. Yesterdays fish and chip wrappers. The point is that virtually all of the subsequent multi-proxy reconstructions make very similar mistakes, using the same flawed series and variants of the same flawed methods. And the flaws were not clearly documented until 2005. Mann’s 2008 paper is a fine example of spurious data mining, for example, and the resulting hockey stick just an artefact of the method. Andy: nice summary in original post. Mikep: if you ascribe any credibility to the Wegman Report, perhaps you can explain to us all the general competence & scholarship level exhibited by the inclusion of the Tom Valentine citation in the WR? So why is Wegman’s criticism of Mann’s methods wrong? That is the substantive issue. Arthur Smith’s smackdown of a Mosher & Fuller (also authors of a “groundbreaing expose” about Climategate) claim about the hockey stick. What happens when writers attempt to claim they know more about a field of science than the scientists they write about. MikeP, you express a wish that paleoclimatologists “stop using methods of proven inadequacy.” You are, I hope, aware that the inadequate method in question is not now in use. The statistical error in MBH 98 did not prove fatal to the hockey stick, and the errors having been corrected the science has moved on. Many of the skeptics, though, are still preoccupied with it, though it is no longer of any significance in the field. I really find this quite puzzling. I genuinely cannot understand why skeptics cannot regularly produce scientific results to test and refine their position, as some mainstream climate scientist or other does every month or so. It’s as if they were all scared of what they might find if they actually did some science. Oh, to be sure there is the occasional paper, but nothing like the volume or quality that would be needed to challenge the mainstream science. The statistical error in MBH 1998 gave a very prominent role to the behaviour of one particular species of tree and its near relations. Without their 20th exceptional growth there would have been no hockey stick. This type of problem pervades the tree ring reconstructions. A few series of doubtful validity as temperature proxies do all the work. the problem is compounded by the fact that many of the reconstructions, see Mann 2008 for a prime example, are just more or less sophisticated exercises in correlation picking. There is no recognition in this literature of the problems of spurious correlation and regression, which have been extensively analysed by econometricians over the last 35 years since Granger and Newbold’s pioneering article (and the problem itself was analysed quite extensively as far back as the 1920s by Udney Yule). MBH is just a symptom of the failure to engage with serious statistical methods. I’m not sure I follow your argument here – are you saying that the statistical methods are bad or that the data is bad (or both)? Inadequate recognition of the dangers of spurious correlation pick out series which there is no real reason to suppose are temperature proxies – they only get picked because of the correlation. So, both I suppose. Thanks for that link to Arthur Smith, J Bowers. From reading the comments I see that, even when you do unequivocally pin down and refute a specific false accusation, there are people who will say that oh yes but that isn’t what *they* meant by “the trick”, and that some third party has researched this in great detail and proven that the scientists lied (although oddly for such a serious accusation, they’re always hazy on the details). And they accuse the *scientists* of playing a shell game! The media’s as bad. The Sunday Times has at last admitted to an horrendous misrepresenation it made about IPCC AR4’s Amazon non-mistake. There’s another more recent one penned by Lawrence Solomon at the National Post, misrepresenting Mike Hulme of UEA. Hulme has published two clarifications so far, but all of the relayers of the Solomon story still haven’t modified their blog posts, including Steven Mosher over at Watts Up With That. And, of course, Dr Andrew Weaver is sueing … no prizes for guessing … the National Post. There are more, as well. But the damage is done and the memes are out there, which is quite possibly the entire point in some cases. Mikep, as I understand it McIntyre says the statistical error is such that it would provide a hockey stick in a monte carlo simulation. Here you say that the persistent hockey stick is due to careful selection of proxies. Are there any peer reviewed papers supporting the latter claim? There are several variants of the basic hockey-stick production method. One of the simplest is as follows. Take a bunch of red-noise series, which are random but autocorrelated so spend some time away from their mean. If you average all the series your average graph will be essentially flat, because all the deviations cancel out. Now choose a shape you want to match, say a hockey stick and only choose for your “reconstruction” those series which show above a given degree of correlation with your target series. Throw away the rest. Average the remainder and you have a lovely hockey stick (or whatever other shape was your target). Jeff Id at the Air Vent has a series of good posts on this. Another thing: it is my understanding that the hockey stick shows up in reconstructions involving no tree rings. Surely there came a point long ago when those with honest objections based on inadequate statistical methods or proxy selection were forced to admit that the hockey stick is sound. This seems to have happened, pretty much, in the science, but for reasons that don’t seem to be related to science at all some bloggers are clinging on to ancient and irrelevant criticisms. Some examples, other than the infamous upside-down Finnish lake sediments? And going back to at least 1400 (no-one serious has denied that temperatures now are warmer than circa 16-1700). That claim depends on what you mean by “the hockeystick”. The RealClimate gang has moved of the goalposts a bit in their posts on the subject and counted things as “a hockey stick” that didn’t include much of a flat “shaft” or that used only the instrumental record to establish the “blade”. Nobody is claiming it’s not warmer now than it was during the Little Ice Age; showing a warming *since then*- since 1600 – is not newsworthy. The newsworthy claim of MBH98 that some warmists have been desperately trying to cling to was that reconstructions show a basically flat trend for the last 2000 years followed by a sudden “unprecedented” uptick in the modern era which dwarfs all prior temperature swings on record. If you entirely eliminate tree rings from the reconstruction, you tend not to get that result. Instead you get a much weaker result. 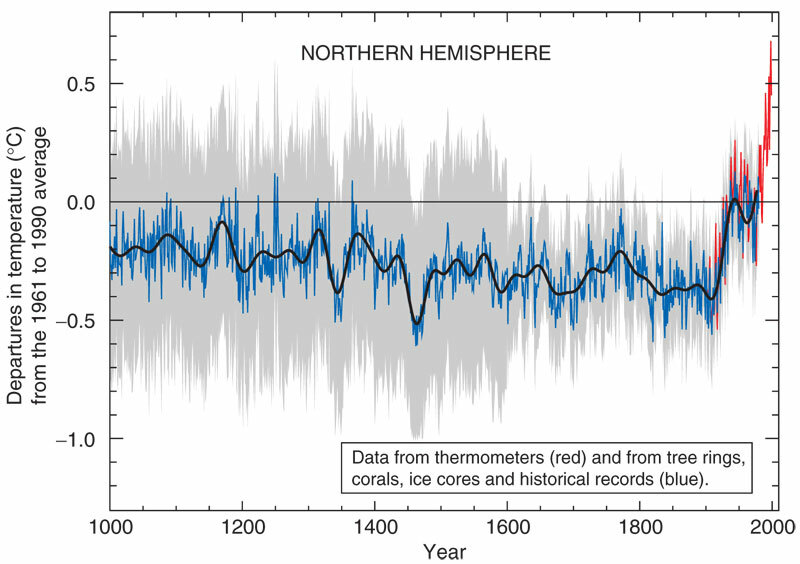 In short, “Temperatures warmest in 400 years; trends not statistically significant prior to that” does not constitute a hockey stick of the MBH variety showing up. Nor does the backwards-S curve Loehle got for the last 2000 years by averaging all the non-treering proxies he could find, nor does the curve Moberg et al got in their reconstruction that used treerings but didn’t let them dominate the resulting shape. Without the tree rings and using proper statistics, the “shaft” tends to get bumpier, the LIA gets cooler, the MWP gets warmer and the statistical confidence with which we can say temperatures are “unprecedented” since the year zero or even the year 1000 falls through the floor. I believe MBH98 referred specifically to 1,000 year timescale, not 2,000 years. That’s an important detail because uncertainties increase greatly the further back you go. And it’s also true that we have about a dozen more recent studies, and while they don’t always show as flat a handle, they nearly all confirm the hockey stick. That’s very impressive, and what you claim some “warmists” say is irrelevant. 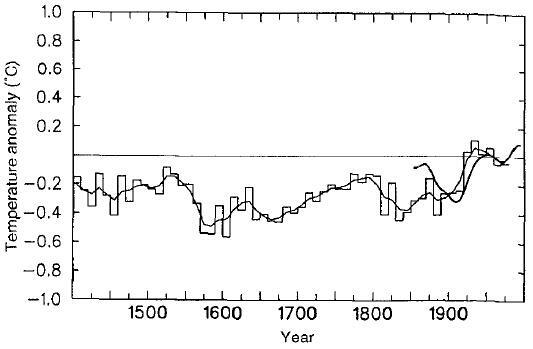 The hockey stick is well established science and tells us something very serious indeed has been happening for the past two centuries. Whether it’s strictly unprecedented is a matter on which there is legitimate debate, but the conclusions we can draw in no way depend on the answer to that question. I don’t understand that claim. A hockey stick has a flat handle. If other studies don’t show as flat a handle, how can that be taken as “confirming the hockey stick”? When a study that uses updated or less questionable proxies or better data-handling has more of an “S” shape, showing that recent temperature swings or levels *aren’t* clearly “unprecedented”, why doesn’t that count as failing to “confirm the hockey stick”? In your view, what would count as a study that doesn’t “confirm the hockey stick”? Moreover, Glen, what you observe as moving the goalposts, scientists call “scientific method”. MBH98 is out of date, and that’s okay. If that never happened to scientific papers then science would be religion, and if the conclusions drawn by scientists did not change from decade to decade there would be no science. It’s robust and well established, which isn’t to say that it’s necessarily true. But to supplant the established science, skeptical scientists conversant with paleoclimatology will jolly well have to do the necessary work. Carping about old scientific papers doesn’t cut it. I’m still hoping to hear any reason why the WR’s inclusion of Tom Valentine, of pseudosciencie & black helicopter conspiracy fame”should be ignored. mikep, references in the peer-reviewed literature, please. Science is not conducted by blog postings. mikep, I won’t respond to your demand for a shrubbery, but I shall provide you with this summary, from Wikipedia, of the findings of Working Group 1 based on the peer reviewed literature. Can you find scientific papers to refute this? If not why not? Do you agree that it correctly summarizes the relevant finding of AR4? Note first the statement about the last 500 years which effectively excludes the medieval warm period. The Mann papers were about 400 and 1000 years. Post 1500 has not really been the issue. Second the use of the terms “likely” and “very likely” are subjective terms reflecting opinion, not quantified uncertainty from probability. I think the first is probably accurate, but I have seen no convincing evidence for the second. Andy, you miss the point of the quote. Wegman thinks it ought to be being discussed in the peer reviewed literature, as do I. But in the absence of such discussion web logs are fine. In my academic career I often found that discussion of papers, which good web logs approximate, was more revealing than the papers themselves. Firstly, I thought it would be funny to quote Wegman as I’d previously been critical of it. Clearly not. I would interpret this as: don’t use blogs to advance the science. This seemed to be Tony’s point. If I’ve missed something in Wegman then please let me know. Andy, following our discussion here (and particularly of interest here following your views on the institute of physics), the views of another scientist on palaeoclimate have come to light. These are the views of Professor Michael Kelly of Cambridge University, who (coincidentally) happens to be fellow of the IoP. Prof. Kelly was a member of the Oxburgh panel, and his commentary relates to the CRU papers on palaeoclimate. The CRU papers (by the likes of Briffa, Jones etc) are largely better than the hockey stick, but suffer from the same problems that the hockey stick did: a lack of rigour in objective selection of data and methods. Like Prof. Kelly, I find no evidence here of scientific malpractice. What I do find are people insisting that selection criteria be left to “expert judgement” – a recipe for selection bias. This applies to pretty much all recent palaeoclimate reconstructions. I come from a similar field (not quite the same) as Prof. Kelly, and it is no surprise to me that people from “hard science” backgrounds – scientific disciplines where there is no way of fudging the data, and where mistakes will be found out – are deeply unimpressed by these valient (but really quite naive) attempts to reconstruct historical temperature data sets. Having spent some time pouring over historical temperature reconstructions, my concerns very closely echo those of Prof. Kelly and I would recommend a read. Starts at around page 81 at this link. The use of the Tiljander proxies in Mann08 was raised earlier in the thread by Jonathan, as an illustration of the continuing, unacknowledged methodological shortcomings in hockey stick scholarship. Having looked into the matter in some detail, I concur with his remarks. The fundamental issue is not complicated or difficult to understand. Tiljander and her co-authors noted increasing post-1720 contamination of climate signals in these lakebed sediments by local human activites. The authors claim that the spurious signals overwhelmed the climate-related signals in the 20th century. Mann and his co-authors acknowledged Tiljander’s concerns in Mann08’s SI, and then went on to calibrate and use those data, anyway. “Are the Tiljander proxies calibratible to the instrumental temperature record, 1850-1995?” No. I covered this and related issues here. Pro-AGW Consensus blogger Arthur Smith has two posts up with active theads at this writing; you can follow the detailed and sometimes-inane discussion here. Ok, that sounds pretty convincing. Thanks for the info. Why did McIntyre not focus on these issues instead of the “upside down” thing, which seems to be a criticism of the method of incorporating the data rather than not using it at all? Mann08 did use two of the four Tiljander proxies (XRD and lightsum) in an orientation that was “upside down,” with respect to the orientations proposed by the originators of the data, Mia Tiljander et al in Boreas, 2003. McIntyre did focus on this and related issues in his PNAS Comment. His account of the problems that he and McKitrick faced with changing and very restrictive word limits and other conditions imposed by the PNAS editors — which McIntyre opines were unreasonable — are somewhere on his blog. Sorry, I don’t have links for that on hand. Of the remaining two Tiljander proxies, Mann08 used darksum in the same orientation as was proposed in Tiljander03. Tiljander03 did not explicitly offer a climate-related interpretation of the fourth proxy, thickness. That said, I now try to avoid the use of terms like “upside down,” because they trigger predictable and distracting reactions in some commenters. Elaboration on this point in my comment at Arthur Smith’s blog captioned Arthur, those are nice “open (sic). It seems to me that mentioning the “upside down” issue in the PNAS comment wasn’t worth it! Re: McIntyre’s use of the term “upside-down” in the PNAS Comment: I could quickly grasp his arguments about Tiljander. I recall first haring about them on 10/26/09. You can see how I looked at the issue from what I wrote atStoat circa 10/27/09 – 10/29/09 The point is that I’m no climate scientist and I’m no genius. So it seems reasonable to suggest that McIntyre’s use of the descriptive (and, in retrospect, confusing or irritating to many pro-AGW-Consensus-blog-advocates) terminology should not have been much of a barrier to understanding. I should point out that only one pro-AGW-Consensus scientist or blogger has, to date, allowed that there are substantial technical problems with Mann08’s use of the Tiljander proxies. And Ari Jokimaki accompanies the reversal of his stance with bitter remarks on McIntyre, which may help keep him in good standing with Consensus advocates. It would be interesting for observers, but perhaps not enjoyable for you, if you were to author a post that stated plainly and unambiguously that you found that Mann08 was grossly mistaken in its uses of the Tiljander proxies. Such is the state of climate science and climate-science advocacy in 2010. In my just-submitted comment (currently in moderation), I provided the wrong URL for “what I wrote at Stoat circa 10/27/09 – 10/29/09.” The correct link is to this annotation of the first Stoat thread on the subject. And Ari Jokimaki accompanies the reversal of his stance with bitter remarks on McIntyre, which may help keep him in good standing with Consensus advocates. There has been no reversal in my stance. From the beginning I have addressed McIntyre’s claims on the issue which are demonstratably false. Do you not understand the distinction between arguing against someone’s claim and arguing for some issue? The mistake in Mann et al. is unfortunate but these things happen. The mistake is meaningless in the big picture of science. On the other hand, McIntyre’s false claims on the issue and the conspiracy theories followed from that are far more serious issue than the mistake in Mann et al. Therefore the focus in this issue should be on the actions of McIntyre. I even tried to explain this to you already in the discussion in my blog to which you linked to, why are you still claiming this? McIntyre has been claiming that Mann et al. have flipped the Tiljander data and McIntyre also has been focusing on figure S9 in Mann et al. trying to make it look like Tiljander et al. data would be wrong way around there, which is easy to show that it’s false. Meanwhile, you seem to be hinting – just like you do to me in the comment I quoted above – that anyone who doesn’t reject the mainstream science cannot look at this issue objectively. Yet at the same time you are trying to paint far too rosy picture of McIntyre’s claims. Thanks for the clarification – the comments on this post got a bit untidy so nice to wrap up some of the points. One reason to link to your original words is to allow readers to return to the source, and see for themselves if my interpretation is correct. Thus, thank you for correcting my misinterpretation. My apologies. That said, the Tiljander data series themselves are unaffected by what you or I think of them. I have plotted them out here (my interpretation of the meaning of these traces is in comment #2 to that post). You can see that (1) these data series are uncalibratable to post-1720 temperature, and (2) there are actually only three data series, not four, as claimed in Mann08. They are entirely unsuited for use as temperature proxies, especially by the methods of Mann08. It should also be noted that Gavin Schmidt of RealClimate has, in dribs and drabs, conceded that Mann08’s use of the Tiljander proxies was invalid. See e.g. the inline response to Comment #529, which refers back to Comment #414. As to conspiracy theories, I have offered none. None are required for a parsimonious explanation of how Mann08’s flaws came to be. To take up that point, the authors of such theories should be identified, and the issue raised with them.